Workplace prosecutions are something that health and safety practitioners should maintain oversight of to identify trends and maintain awareness of foreseeable hazards. This article provides an overview of the prosecutions listed by WorkSafe Victoria and SafeWork NSW between January and April 2016. 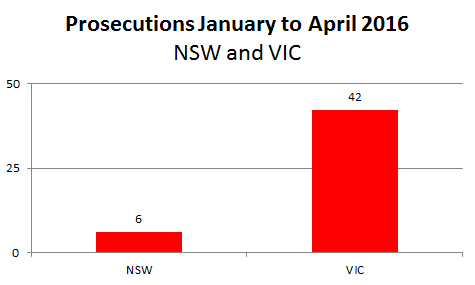 The first 4 months of 2016 saw a total of 42 health and safety prosecutions in Victoria and a total of 6 prosecutions in NSW. 1 prosecution involved both the Occupational Health and Safety Act 2004 and the Dangerous Goods Act 1985. 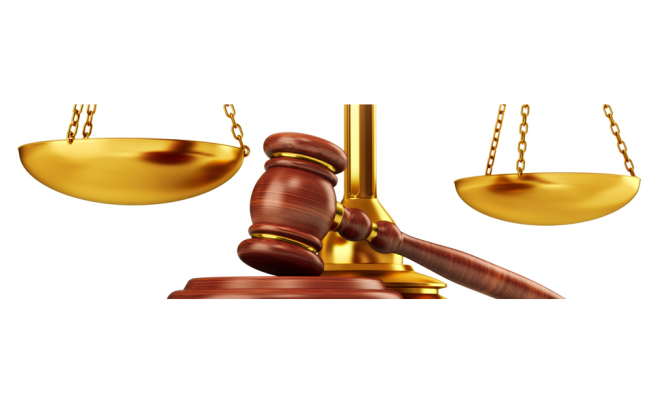 5 prosecutions were recorded against the Work Health and Safety Act 2011. In NSW each prosecution resulted in a monetary fine. 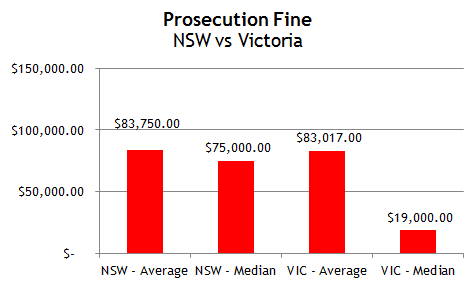 In Victoria 40 fines were issued (95% of the total prosecutions). In addition to the fines, WorkSafe Victoria issued 2 Enforceable Undertakings. In these cases, the enforceable undertaking is a legally binding agreement between WorkSafe Victoria and the employer. The employer is obliged to carry out the specific activities outlined in the undertaking. Such scenarios ensure that the workplace implement agreed corrective actions. Prosecutions: What is the Cause and where are the Gaps? With respect to the criteria/codes that lead to prosecution – the top 10 criteria, as defined by WorkSafe Victoria, are outlined below. Consider safety when procuring equipment – how effective is guarding? Considering safety when engaging contractors. It is noteworthy to comment that six (6) of the prosecutions in Victoria were associated with the failure of the workplace to isolate energy when repairing and/or cleaning equipment. All workplaces that have plant and equipment should strongly consider establishing Safe Operating Procedures (SOPs) in consultation with their operators, and ensure that their workers and contractors have been trained and competent in these. Once the loading of a truck was complete, the truck driver asked the employee operating the forklift to lift him up onto the truck on the tynes of the forklift. The forklift operator stated that he knew it was the wrong thing to do but he did it anyway. Whilst being lifted, the truck driver’s right hand became entangled in the mast and mast channel of the forklift. The truck driver suffered bruising and some lacerations to his hand, but did not receive treatment as an inpatient in hospital. The offender pleaded guilty and was, without conviction, sentenced to pay a fine of $18,000 and to pay costs of $3,895. A workplace was transferring a 660 litre bin loaded with cardboard through an Automated Car Park Station. While waiting in the car park, an elderly women was struck by the corner of a 660 litre wheeled waste storage bin loaded with cardboard. The woman was knocked to the floor. The offender pleaded guilty and was, without conviction, sentenced to pay a fine of $50,000.00 and to pay costs of $4,564.00. It was reasonably practicable for the offender to control the risks to health and safety associated with the task by ensuring bins were not overfilled with cardboard, using a spotter when transporting bins through public areas and scheduling of loaded bin movements out of hours to minimise risks to the public. A manufacturing company that produces materials for the construction industry was sentenced to pay a fine of $40,000.00 and to pay costs of $3,975.00 following a worker breaking their leg after the 500 kg material collapsed while undertaking the task. The “task” involved two (2) employees lifting and loading a suspended material weighing 500 kilograms onto a flatbed truck. There was no safe system of work associated with the task of lifting, transporting and loading facade modules at the workplace. It was reasonably practicable for the offender to control the risk by implementing a safe operating procedure for lifting, transporting and loading materials which included the identification of the risks and the associated control measures. A company that provides cleaning services to various businesses via engagement of subcontracted cleaners. A cleaner was engaged to clean at a meat and poultry production business. The cleaner was cleaning a mixer (which had an interlocked grate at the top, but access via the exit point at the bottom) which mixed meat. The cleaning company failed to ensure that the workplace was safe, by failing to ensure that the workplace where the cleaning was to take place provided adequate information, instruction and training to the subcontractors, in relation to the lockout/tagout system for isolation of the mixer prior to dismantling and cleaning it, and failed to prohibit its subcontractors from working until such adequate information, instruction and training was provided. The cleaner was cleaning the mixer with a hose and a scourer and put his hand with the scourer through the bottom opening to remove the debris. The mixer began to operate and his left hand was caught by a rotating auger, severing three fingers, only two of which were able to be surgically re-attached. The offender pleaded guilty and was, with conviction, sentenced to pay a fine of $20,000 and to pay costs of $7,000. An employee, who was given the job of preparing the rig for work, was unfamiliar with its controls and had never installed or been trained in how to install the 1.8 metre leader extension which had to be fitted to the mast. Despite reporting his concerns to his supervisor, work on preparing the rig continued. As a result, 10 of the 16 bolts needed to secure the leader extension to the rig were not fitted. Later that day the deceased was working at the top of the rig when the mast snapped causing the deceased to fall to the ground, along with a 20 metre section of the mast. A conviction was imposed and a fine of $750,000.00. An employee suffered serious arm and hand injuries which required hospitalisation after attempting to clean a cannelloni dough mixer. The guarding on the dough mixer did not prevent access to the danger area, due to the interlock device that was fitted not isolating power to the rotating paddle inside the feeder hopper. There were no policies, procedures or instructions for the cannelloni dough mixer. The incident was not reported to WorkSafe immediately or in writing in 48 hours, and the incident scene was not preserved. The offender pleaded guilty and was, with conviction, sentenced to pay a fine of $30,000.00 and costs of $2,557.00. A 15 year old employee of a labour hire business was driving a forklift. Three children (two of whom had no prior farm work experience), were left unsupervised and the forklift was accessible to those three children in that the keys were left in the ignition. There was a risk of serious injury or death to employees using the forklift without being licenced, and that leaving the keys in the forklift allowed unauthorised access to the forklift. The deceased was killed when the forklift he was driving tipped over causing fatal injuries. The offender pleaded guilty and was to pay a fine of $450,000. It is worth mentioning that 10% of the prosecutions were the result of workplaces that failed to notify WorkSafe Victoria that a notifiable incident that occurred in their workplace, and 7% of the prosecutions were the result of workplaces that failed to preserve the incident site. Both of these requirements are expressed clearly within Section 38 of the Occupational Health and Safety Act 2004. If your workplace is not familiar with what incidents require notification, or, if there is no reference in your procedures on how to manage a notifiable incident – this is something you should consider reviewing immediately. Please Contact Us if you require direction. Prosecution history (from convictions to regulator notices received). Safe workplace practices will reduce your workplace’s likelihood of incident and/or injury, and support your workplace growing. The output being a productive workplace that provides workers with both confidence and job security. Planning: Safety in Design – When and What to Consider? Planning: What is your health and safety strategic plan? Training: Are you training for compliance or safety? Technology: Wait, there’s more “stuff” that you don’t have easy access to! Action OHS Consulting, working with you to build a safe workplace together.